The Meerkat Motto: You get by with a little help from friends. Sid's Story: Our vision is to create the first sanctuary in Africa that is exclusively for Meerkats. To improve the lives of former pet Meerkats and to educate the public about the adverse effects of keeping these wild animals as pets. We were inspired by a Meerkat that adopted us and literally changed our lives. This Meerkat with an attitude pitched up on our doorstep a year ago, we called her Sid (her attitude suggested she was a male). Her irregular visits became more frequent in the Winter, stealing our cat's pellets when she got the chance and on chilly nights sleeping in a kitchen cupboard next to the warmth of our Aga stove. She came and went as she pleased, roaming free on our farm. Walking on our farm we often spotted her amongst a resident clan of Ground squirrels. She slept in their burrows when she wasn't with us and was never part of a Meerkat family...always an outsider. It was obvious that she was once somebody's pet and we presume that she escaped. What makes Sid's story unique is that it is highly unlikely that a lone Meerkat will survive in the wild on their own. Being highly social animals they rely on their family structure to survive. After not seeing Sid for two weeks we were concerned for her safety as her habit was to visit us every day or second day. When she eventually came home we were overjoyed to discover she was heavily pregnant! Another miracle...that a wild Meerkat would mate with her. That same evening (4 Dec 2014) she gave birth to a litter of five healthy pups in our kitchen cupboard. We believe she came home to have her pups as she knew they would die being the offspring of a lone Meerkat with no family clan. Her tenacity and will to survive against all odds has moved us deeply. It has been the most remarkable thing to have a free roaming Meerkat consider us as her family. The fact that she trusts us with her pups is incredible...as is the fact that this Meerkat that was doomed to a lonely life on her own now has her own real family. She will always be a part of our lives...a crazy Meerkat that adopted us. We believe it is our purpose and duty to create a safe place free of predators for Sid, her family and other former pets like her. Help us make this dream a reality! 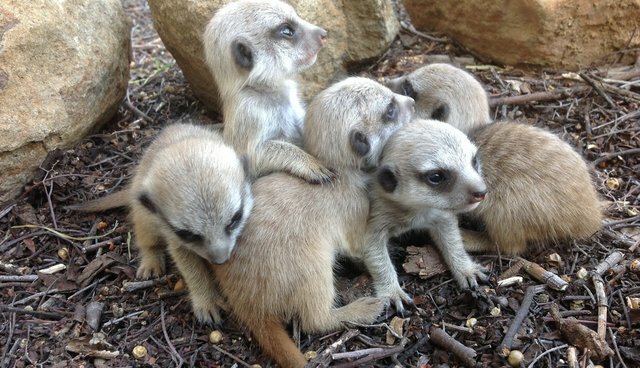 Show support by liking our page on Facebook: www.facebook.com/meerkatsanctuary and follow the Mini Sids' progress from birth!